you need to buy yourself more clothes. as he fixates on a five foot square. in search of negative light. means you end up forgetting there's grey. but it can seem awfully dull. 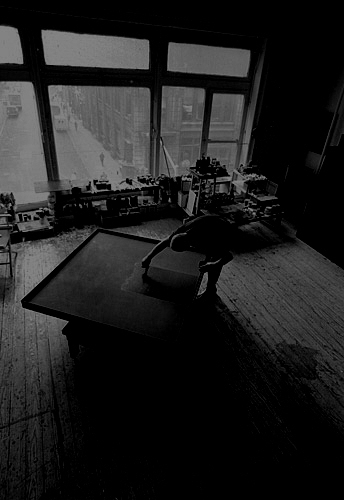 Ad Reinhardt is not your friend. on repainting his work every week. it must, it must, it must. "A lost broadcast from the past." like a landscape lurking somewhere in the dark. "art as art as art as art". blacking out the mind from a bruised body and spirit. for a gentle fix of a repainted square. from the ordinary to something other glowing behind. "The way somebody says a name, you get a vibration." appears first thing in the morning. are blank windows looking onto the inside of the city. you understand what night really is. bitumen's gritty memory, absences, black outs.